Russian President Vladimir Putin, left, and U.S. President Donald Trump during a photo session of world leaders on the closing day of the 25th APEC Summit on Nov. 11, 2017 in Da Nang, Vietnam. National security adviser John Bolton said Sunday that President Donald Trump would raise the question of Russian interference in the 2016 election when he meets with Vladimir Putin this month, even as Trump himself sidestepped a question about whether he would do so. 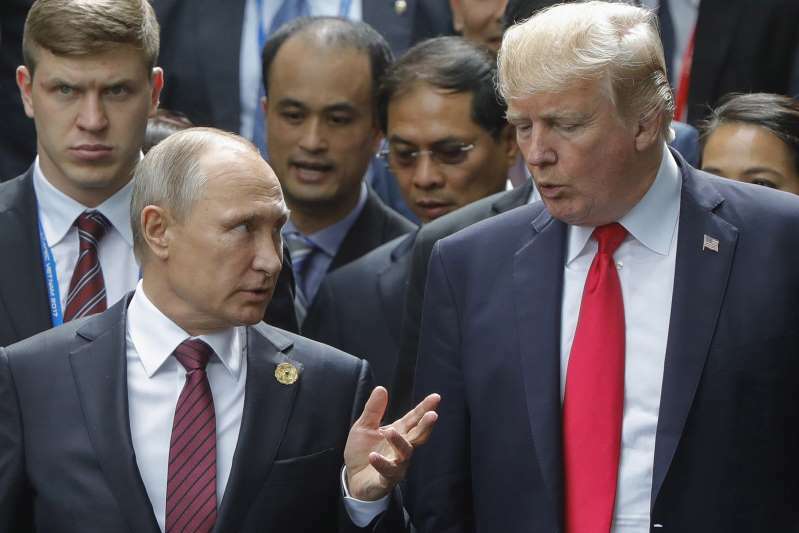 Looking ahead to a Trump-Putin encounter, Bolton also brushed aside questions about whether Trump had been too eager to accept the word of Kim Jong Un when he met with the North Korean leader last month, seeking to quell North Korea's nuclear ambitions. Trump said on Twitter after that encounter that there no longer was a nuclear threat from North Korea, an assessment that many diplomatic and nuclear experts dispute. Bolton appearing on CBS, touted a U.S. timeline that he said called for the dismantling of North Korea's nuclear and ballistics programs within a year. But he declined to comment on a Washington Post report citing intelligence officials as saying that after Trump-Kim meeting. North Korea had sought to mislead the United States about the size of its nuclear arsenal and hide the existence of some nuclear facilities. In a separate interview on Fox, Bolton offered a testy assessment of critics who have questioned the president's negotiating style with foreign leaders - including a disastrous encounter with other members of the Group of 7 last month_ as off-the-cuff, impulsive and ill-informed, with a tendency to flatter authoritarian figures while slapping down longtime U.S. friends. "I don't think anybody ought to have a case of the vapors over discussions we have in NATO or the G-7, versus discussions we have with Putin or Kim Jong Un," Bolton said. "They're very, very different - the president treats them differently. He understands what the strategic interests are, and that's what he's trying to pursue." Less than two weeks before a NATO summit in Brussels, Trump again struck a combative tone Sunday toward traditional U.S. allies, issuing new warnings on trade and declaring that "we spend a fortune on NATO." He also renewed criticism of the European Union, calling the bloc "possibly as bad as China" on trade.